A battle over hotel space in Rochester, Minn., erupted into the open Friday. Bloom International Realty, the developer behind a high-profile hotel, condo and retail complex on the Zumbro River, said the project stalled because Mayo Clinic is partnering with Pontiac Land Group, a luxury hotelier from Singapore, to put a competing hotel on top of one of its busiest buildings. 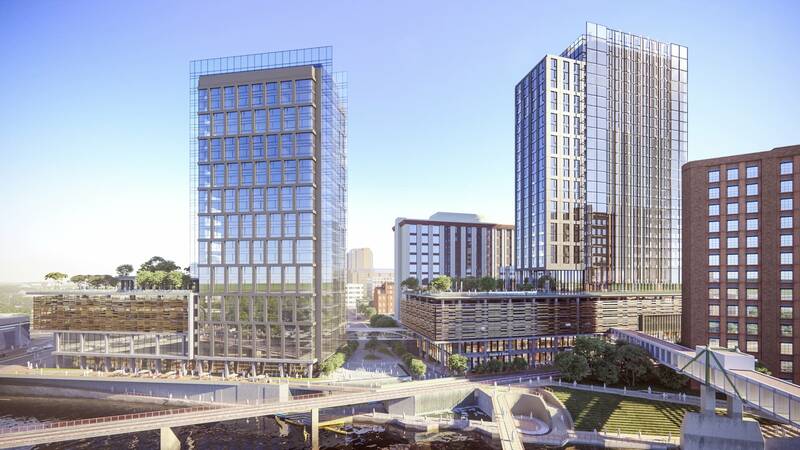 "Bloom was blindsided by Mayo Clinic's announcement that it intends to develop an upscale hotel, directly on its site, in partnership with the Pontiac Group," Bloom senior vice president Sameh Muhtadi wrote in a letter to the city. "The location of that hotel and its connection with Mayo Clinic create a considerable competitive disadvantage for our project. Whether demand over the next few decades would support two upscale hotels in such close proximity has not yet been determined." Mayo partnered with Pontiac because it allowed them to complete a planned 11-story expansion of its iconic Gonda Building ahead of schedule. Mayo will cover the cost of four floors of new clinic space, while Pontiac will finance the remaining seven floors of hotel space. Mayo spokesperson Kelley Luckstein did not say whether Mayo considered the impact on the Bloom project. She issued a statement saying the expansion helps meet the needs of patients. "Mayo Clinic is incredibly pleased with the pace of private investment occurring in the marketplace to secure Rochester's future as a national and international destination medical center," she said. Bloom's letter is the most recent development in a partnership that started unraveling about six weeks ago, when Bloom, which is based in Abu-Dhabi, said it was considering scaling back its original two-tower plan. At the time, Bloom asked city officials for more time to assess the market for the second tower, which would include a luxury hotel. When Bloom failed to meet a city deadline to detail its next steps for the site, local and Destination Medical Center economic development project officials decided to move on from the project. "Too bad; so sad. Let's go do something better," said Destination Medical Center board chair R.T. Rybak who once lauded the project as a "home run." The competition for well-heeled visitors to Mayo Clinic has attracted other new hotel developments, too. A high-end Hilton will open this year downtown and another nearby hotel is getting a major face-lift. The development is driven by the Destination Medical Center project, which aims to transform Rochester and help Mayo remain competitive for patients and talent. Meanwhile, nine new Destination Medical Center-related projects are slated to open this year with two dozen more in the pipeline. But the $230-million Bloom project stood out because it was often held up by local officials as the type of large-scale, mixed-use development the city wants more of. Former City Administrator Stevan Kvenvold said that when the developers first approached the city, which owns the riverfront land, it was early in the medical center's evolution. "It was a wonderful looking project, and had it materialized it would have been a great project, in my opinion, for the community," Kvenvold said. But now, new faces in the city administration and city council say the city was overly generous with Bloom. Back in 2015, the company got exclusive rights from the city to develop the land, which is not unusual. But the city council also approved two extensions for the project amounting to a four-year window when they had a chance to plan for the site. It seemed things were finally moving ahead this past summer when the city council and the medical center's board approved a record $18 million in tax subsidies for the project. In retrospect, Kvenvold said giving Bloom all that time was not a good idea in part because it meant a lot of city staff time was spent on a project that never materialized. "Four years is just too long," he said. "I wouldn't think that the city would repeat the time for some future project that they did for Bloom." Now that the Bloom project has stalled, city officials say they are likely to reopen the land to new proposals. For its part, Bloom says it's still interested in building on the site but expects it will have to compete with other developers going forward. Bloom has also reached out to Pontiac Land Group in Singapore to see if there's a way to build a single luxury hotel together.